Home » What is Hempcrete? Hempcrete is a bio-composite made of the inner woody core of the hemp plant mixed with a lime-based binder. The hemp core or “Shiv” has a high silica content which allows it to bind well with lime. This property is unique to hemp among all natural fibers. The result is a lightweight cementitious insulating material weighing about a seventh or an eighth of the weight of concrete. Fully cured hempcrete blocks float in a bucket of water. It is not used as a structural element, only as insulating infill between the frame members though it does tend to reduce racking. All loads are carried by internal framing. Wood stud framing is most common making it suitable for low-rise construction. Hempcrete buildings ten stories high have been built in Europe. The material is mixed in mortar mixers for 1-2 minutes and stuffed by hand into the wall cavities. The wall is slip-formed with temporary wooden or plastic “shuttering” forming the inner/outer surface forms. The material is lightweight and can be moved easily about the site in tubs and passed up bucket-brigade fashion to workers filling the cavities. Site clean-up is easy. Simply till it into the soil. The material is finished on the outside with a hard render coating about 20mm thick to protect it with a final colored topcoat finish added. The end result appears like any stucco finished building. The inside can be left natural or finished with lime plaster for a traditional look. Hempcrete was discovered in a bridge abutment in France built in the 6th century. Since its rediscovery it has seen growing use in Europe. Industrial hemp is grown by certified commercial growers so the crop can be certified to be very low in THC. Hemp is not psychoactive. Given it has survived 14 centuries, people expect hempcrete buildings will have a long life. Hemp itself is a beneficial crop requiring no fertilizer, weed killer, pesticide or fungicide. It grows so thickly that weeds cannot grow. Farmers grow it in rotation with other crops such as barley or rye. The crop following the hemp requires no weed killer because the hemp has driven weeds out. The hemp seed is harvested as a nutritious food supplement rich in Omega-3 oil, amino acids, protein and fiber. It is considered a “super food”. The outer fibers are used for cloth usually as a blend with 45% cotton. The woody inner core is chopped to uniform size for our use. It has been traditionally used as animal bedding. Thoroughbred horse owners demand it. For over 60 years, growing hemp in America has been illegal, because it resembles its psychoactive cousin marijuana. It is grown legally in Europe, the UK and Canada through a system of licensed growers producing seed certified low in THC (<.05%). Farmers must buy their seed from these seed growers and their fields are inspected periodically. Our hemp must be imported from the UK. A new plant to process the hemp core is being built in Canada so there should be a North American supplier soon. This added shipping reduces the carbon-negative feature of hempcrete in North America and adds to production costs. It causes additional logistic costs since we had to buy a 40-foot container of material and store it on site. You must have people waiting for the truck with rented equipment to empty it, and you need dry weather. The truck charges nearly a hundred dollars an hour wait time while you unload for half a day. We filled a two-car garage with our material leaving a 4 foot margin for work around the edges. You have to keep this material dry until used so plan for adequate tarps. For technical details and sources, check the Wikipedia entry for Hempcrete. 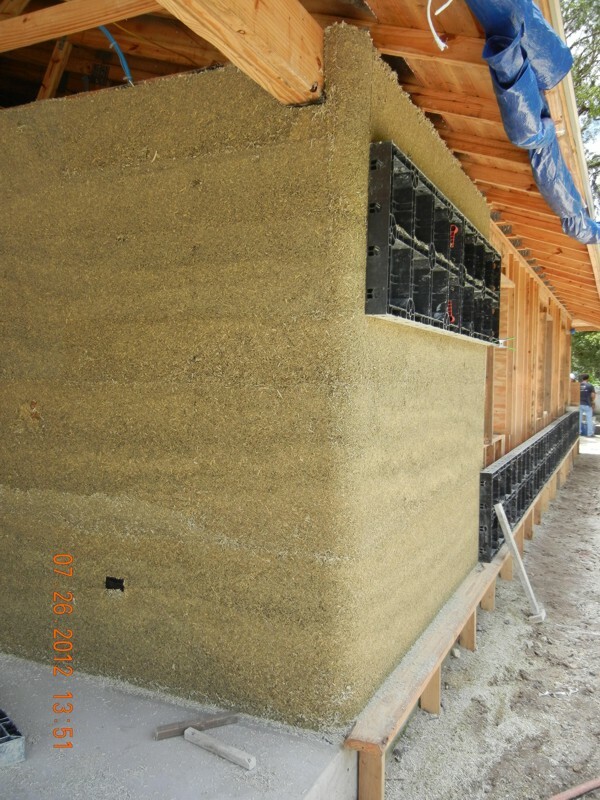 Q: Can I use smaller foundations for a Tradical® Hemcrete® house? A: Yes, you may be able to use shallower/smaller foundations, subject your engineer’s recommendations and local building codes. Q: How thick do the walls have to be to comply with Building Regulations? A We recommend 300mm for most domestic applications. Q: Can Tradical® Hemcrete® be used in a loadbearing capacity? A: It is normally used together with a timber frame (or steel or concrete), with the frame transferring the vertical load of the roof and upper floors. The Hemcrete® can be used to provide racking strength to the frame if required. Q: Is Tradical® Hemcrete® available as blocks? Q: Is Tradical® Hemcrete® fire proof? A: Yes. Contact us for test details. Q: Can Tradical® Hemcrete® be used for other building purposes besides walls? Q: Does Tradical® Hemcrete® need weather protection? A: Hemcrete® walls are normally finished with a lime render or covered with a rain-screen cladding (masonry or timber) of some sort to protect them from the weather. We expect to launch a weather proof Hemcrete®, which will not need rendering, in the near future. Q: If it is used as an external wall does it need a cavity? A: No. Tradical® Hemcrete® provides the insulation and is used as a monolithic (solid) walling material. Q: Does it need expansion joints when used in long walls, if so how often? A: No. The mechanical characteristics of Tradical® Hemcrete® are such that movement joints are not normally required. Q: How air-tight is Tradical® Hemcrete® ? Q: Does Tradical® Hemcrete® have a warranty? A: Tradical® Hemcrete® carries a manufacturers warranty covering the replacement of any defective material. The contractor or sub-contractor installing the Hemcrete® would warranty the work (subject to the conditions of the contract used). Q: How much does it cost to build with Tradical® Hemcrete®? A: Cost obviously depends on scale and design, however spray applied Tradical® Hemcrete® is comparable with conventional construction costs. Q: Can Tradical® Hemcrete® be used in the renovation of old buildings? A: Yes, Tradical® Hemcrete® can be used to form infill panels for historic timber framed buildings. Q: How high can a building of Tradical® Hemcrete® be designed? A: The Hemcrete® is not load-bearing, so the limitation is only on the structural frame. Q: How much CO2 is locked up in Tradical® Hemcrete®? A: Spray applied Hemcrete® locks up around 110kg of CO2 per cubic metre. Shuttered and cast Hemcrete® locks up around 110kg to 165kg of CO2 per cubic metre, depending on the level of compaction during construction. Q: Does Tradical® Hemcrete® breathe? A: Yes. The word breathability is often used to describe Hemcrete® buildings. There are various ways in which materials deal with moisture (water vapour permeability, capillarity and hygroscopicity). Tradical® Hemcrete® performs well in all these areas in order to provide a healthy internal environment. Q: Is Tradical® Hemcrete® resistant to pests? A: The Tradical® HB binder protects against rodent and insect infestation. Q: How long will Tradical® Hemcrete® last? A: The use of plant based materials mixed with mineral binders such as lime or clay go back thousands of years. We know that the effects of the binder (high ph and good capillarity/vapor permeability) create a perfect environment in which to preserve the hemp shiv. Consequently we have confidence in anticipating a life-span of Hemcrete® buildings measured in centuries. Q: How do I know whether it is better to cast or spray the Hemcrete® in my walls? A: In general casting is used for smaller projects (less than 50-70 cubic meters) or where labor is provided by volunteers or self builders. Casting becomes more economic for larger projects (in excess of 70 cubic meters). Q: Can Tradical® Hemcrete® be installed in the winter? A: Yes, providing the temperature is not below 5°C and the material is protected from frost and heavy rain. Q: How do I find a contractor to use Hemcrete®? A: Your Tradical® Hemcrete® supplier will be able to give you a list of spray contractors who operate nationwide. Q: How high can one build in a day with Tradical® Hemcrete®? A: There is no real limit other than practical arrangements on the site. Q: Where can I buy Tradical® Hemcrete®? A: Tradical® Hemcrete® can be purchased directly from American Lime Technology, contact us.